Manila—(PHStocks)—Philippine stocks soared on Thursday, 19 September, buoyed by the U.S. Federal Reserve’s announcement that they will maintain the economic stimulus package – surprising many who have been speculating for the longest time that the central bank would cut back on its $85 billion a month bond-buying program. The Philippine Stock Exchange index (PSEi) jumped by 2.81% or 177.74 points to close today’s trading at 6,511.7 – breaking the 6500 barrier again. All counters are back in the green, led by the Property sector (+4.65%), followed by the Financials (+4.08%). Leading the property segment is MEG, which gained 7.1%, followed by CPG, which edged higher by 6.58%. 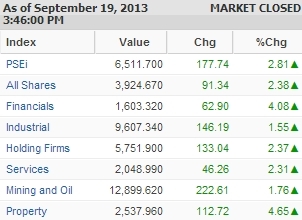 The Financials, meanwhile, was led by BDO, which posted a 6.67% gain, followed by SECB, which gained 6.57%. The wider All Shares index, meanwhile, gained 2.38%. Trading was heavy today. Value turnover reached PhP15.97 billion on 1.78 billion traded shares. There were 133 gainers against 36 losers, while 35 stocks were flat. Today’s most active stocks in terms of value are Alliance Global Group Inc. (AGI, PhP26.00, NC), BDO Unibank Inc. (BDO, PhP80.00, 6.67%), Metropolitan Bank & Trust Company (MBT, PhP88.60, 3.63%), SM Investments Corp. (SM, PhP829.50, 5.67%), Ayala Land Inc. (ALI, PhP29.45, 4.8%), SM Prime Holdings Inc. (SMPH, PhP17.60, 4.14%), Megaworld Corp. (MEG, PhP3.47, 7.1%), Manila Electric Company (MER, PhP286.00, 3.03%), Ayala Corp. (AC, PhP619.00, 5.63%), and Bank of the Philippine Islands (BPI, PhP100.00, 3.09%).